Born in present-day city of Lima in Peru, of Spanish parents, this future saint was named Isabel at birth, but because of her beauty and naturally rosy cheeks, was nicknamed Rose. She led a very holy early childhood, undertaking on her own initiative, many penances. Aware of her physical beauty, Rose intentionally dressed to make herself appear unattractive, rubbed pepper in her face to worsten her complexion, and kept her air very short so as to avoid the admiring eyes of others and to help her avoid her own vanity. Her parents did not approve of her wishes to live in a cloistered society. Her only means of escape and refuge was a private garden at home. 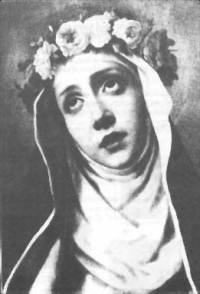 By the time she was 20 years old, she joined the Third Order of Saint Dominic and increased the already extreme penances. When her family fell upon financial troubles, Rose, among other things, sold flowers to help. As she grew, she also dedicated a room in her home to care for the very young and very elderly - a room that to this day still exists and is used for the same purpose in her honor. 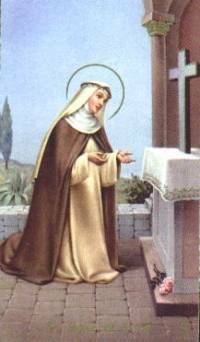 Saint Rose was the first canonized saint of the New World.